Dubai has amazed the world with its luxurious extravagance and imposing skyscrapers that dominate its skyline: In this excursion we can admire some of the most captivating ones and we have the unique opportunity to sip an aperitif at a height of 200 metres. Our exciting excursion will start at the Burj Khalifa, the tallest man-made building in history. 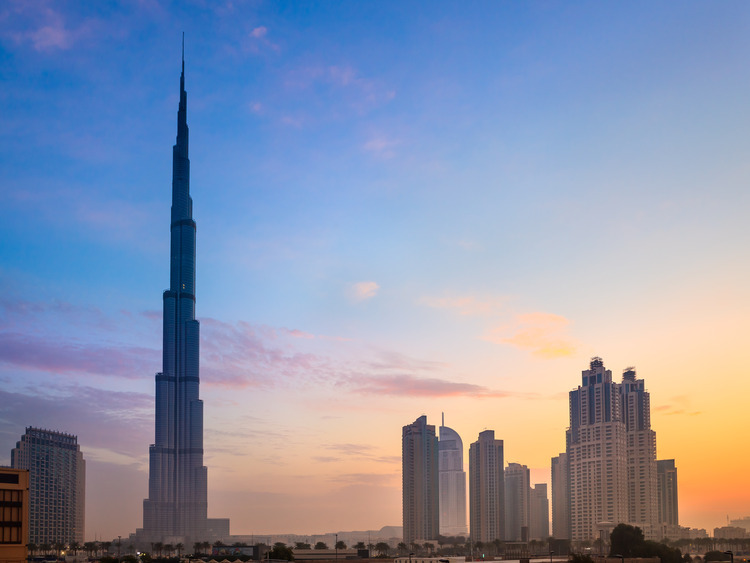 Our visit to the skyscraper will begin at the reception on the ground floor with a multimedia presentation on the fascinating history of Dubai and the Burj Khalifa. From the reception, we take an exhilarating ride in the lift at a speed of 10 metres per second, up to the 124th floor where we can admire the 360° panoramic view of the city, the desert and the ocean. Next, we will admire the super-luxury Burj Al Arab hotel and take some stunning photos of this distinctive sail-shaped building located on an artificial island. Our next destination is the fascinating Palm Jumeirah, a huge artificial island with luxury resorts and hotels that has been labelled the "eighth wonder of the world", and a residential area where we stop to take photos along the artificial 12 kilometres long breakwater. Our last stop will be The Observatory restaurant in the Marriott Harbour hotel, where we can sip a refreshing aperitif whilst enjoying stunning views from a height of 200 metres of the sun setting over the sea, with breathtaking flashes of colour over Dubai Marina and the Palm Jumeirah. Places on this excursion are limited. We recommend booking in advance. Being one of the main attractions of the city, there is the possibility of finding long queues at the entrance. Comfortable shoes and clothing are recommended. Due to the marked variations in temperature between the sites visited on this excursion and the air-conditioned vehicles, we recommend you bring a light, cotton pullover.